Good response. Elisabet Loose, training manager at Beerenberg, in conversation with enthusiastic students. Beerenberg is to recruit new apprentices in the ISS disciplines (insulation, scaffolding and surface treatment / industrial painting). “Attracting qualified labour with professional skills fit for the future is a priority for Beerenberg. In 2019 we will therefore invest a great deal of time in training young people. 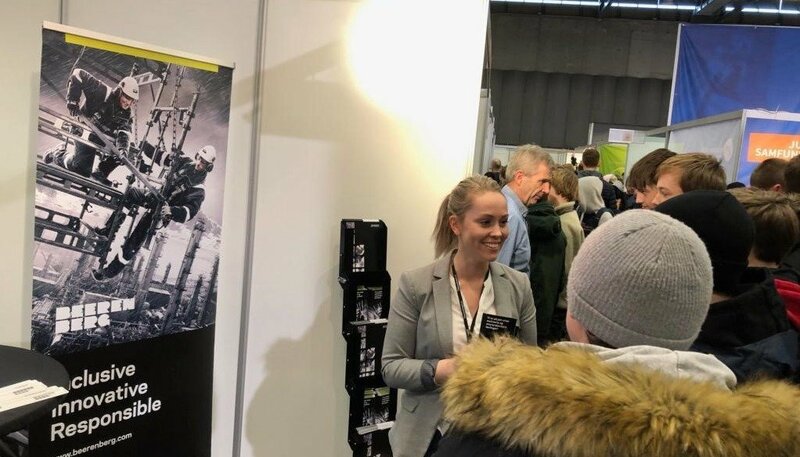 We see it as part of our social responsibility,” says Elisabet Loose, training manager at Beerenberg, about the background to the recruitment drive. Apprentices undergo extensive training to give the right candidates a good starting point for working offshore. “One aspect of the training is to develop the apprentices’ ability to work independently and with attention to detail and to ensure that they have the technical skills required to do the job in a professional manner. We also seek to encourage creative thinking and develop their ability to communicate with customers, colleagues and other partners,” says Loose, who thinks the apprenticeship programme will prove to be an exciting and challenging experience for the right candidates. Paid training on an apprentice salary under the Industry Agreement is one of the benefits offered by Beerenberg. “There are also good prospects for permanent employment and further promotion at Beerenberg after completing the apprenticeship,” says Loose. The company is looking forward to the process and has received good feedback from the young people they met at the education fair. “We have spoken to many young people who are curious about the opportunities we offer and have clearly stated that they see this as an attractive career path. Beerenberg is a great place to work with many dedicated and talented employees ready to welcome motivated apprentices,” Elisabet Loose concludes. Do you want to become a Beerenberger?